Fujian tulou and the hakka villages scattered around the mountain triangle in southwestern Fujian, China.The so-called earthen buildings (tulou in Chinese) are attracting more attention in China and the other parts of the world. Fujian tulou are mostly built between the 12th to the 20th centuries. Tulou is usually a large enclosed building, rectangular or circular in configuration, with a very thick weight supporting earth wall (up to 6 feet thick) and wooden skeletons, from three to five storeys high, housing up to 80 families. These earth buildings usually have only one main gate, guarded by 4-5 inch thick wooden doors reinforced with an outer shell of iron plate. The top level of these earth building have gun holes for defense against bandits. 46 Fujian Tulou sites including Chuxi tulou cluster, Tianluokeng tulou cluster, Hekeng tulou cluster, Gaobei tulou cluster, Dadi tulou cluster, Hongkeng tulou cluster, Yangxian lou, Huiyuan lou, Zhengfu lou and Hegui lou have been inscribed in 2008 by UNESCO as World Heritage Site,"as exceptional examples of a building tradition and function exemplifying a particular type of communal living and defensive organization, and, in terms of their harmonious relationship with their environment". To discover the spectacular hakka earth castle,you can select our Fujian tulou one day essential tour or Fujian tulou two day classical tour. 8:30-11:30: Pick up at 08:30 a.m. and take a 3-hour scenic drive to Tianluokeng hakka cluster (田螺坑土楼群), located in Shuyang Town,take a overview at the top of the mountain (view platform), The castle, composed primarily of four round houses plus one rectangular earthen house, which is named 4 dishes and 1 soup.It is one of the most magnificent and well- preserved hakka houses in the area. 14:00-15:30: 15 minutes coach transfer to Xiaban Village(下坂村),visit Yuchanglou(裕昌楼)(leaning structure hakka house),then pass Taxia village(塔下村)(one of the beautiful village build along a stream),roaming at this water village,visit Zhang's clan ancestral hall(张氏祠堂),which is listed among the key culture relics protected under national level. 15:30-16:30: 20 minutes coach transfer to Gaotou village(高头村),visit Chengqilou(承启楼),the largest grandess circular building composed by 4 cicular buildings. 18:00-19:00: Having dinner at local restaurant,after dinner,enjoy a free walk at this quiet and peaceful town. 08:30-12:00: Check out from the hotel in the morning,20 minutes driving to Nanxi Hakka earthern building cluster(南溪土楼群),visit Huanjilou(环极楼),Zhenfulou(振福楼),Yanxianglou(衍香楼). 11:30-13:00: 30 minutes driving to Yongding Hakka Cultural Village(永定土楼群),having lunch. 13:00-15:00: Visit Yongding Hakka cultural village,including Zhenchenglou(振成楼) ( a magnificent building combining the Chinese style with the western style),Kuijulou(奎聚楼)( a palace style building),Fuyulou(福裕楼) ( a five-phenix style building) , Rushenglou (如升楼)( a mini-sized circular building). 15:00-18:00: 3hrs driving, back to Xiamen. 08:30-12:00: Pick up at 08:30 a.m. and take a 3.5hrs scenic drive to Yongding Hakka cultural village (the most concentrated of all earthen house clusters). 11:30-12:30: Arrive at Yongding Hakka cultural village, have a traditional hakka lunch at one of the hakka house. 12:30-14:30: Visit Yongding Hakka cultural village(永定土楼群), including Zhenchenglou(振成楼)(a magnificent building combining the Chinese style with the western style), Kuijulou(奎聚楼)(a palace style building), Fuyulou(福裕楼) ( a five-phenix style building ), Rushenglou(如升楼) ( a mini-sized circular building). 14:30-15:30: 10 minutes private coach tansfer to Gaotou village,visit Chengqilou(承启楼),the largest grandness circular building composed by 4 circular buildings. 15:30-18:30: 3hrs driving, back to Xiamen. 8:30-11:30: Pick up at 08:30 a.m. and take a 3-hour scenic drive to Tianluokeng hakka cluster(田螺坑土楼群), located in Shuyang Town, take a overview at the top of the mountain (view platform), The castle, composed primarily of four round houses plus one rectangular earthen house, which is named 4 dishes and 1 soup.It is one of the most magnificent and well- preserved hakka houses in the area. 08:30-11:30: Pick up at 08:30 a.m. and take a 3 hrs scenic drive to Shuyang town Nanjing county. 11:30-12:30: Arrive at Nanjing county, have a lunch at the Shuyang town. 13:30-14:30: Visit Hekeng tulou cluster(河坑土楼群). Pick up at 08:30 a.m. and take a 3-hour scenic drive to the idyllic Yunshuiyao Village (云水谣). Then transfer to Tianluokeng Tulou Cluster (田螺坑土楼群) to visit the '4 dishes and 1 soup'. After that go to Taxia Village (塔下村) to visit one of the China's Top 15 Scenic Villages. Visit Chengqi Lou (承启楼) the largest grandness circular tulou composed by 4 circular building and Hongkeng Tulou Cluster (洪坑土楼群), the most concentrated place of earthen house clusters. We will drive back to Xiamen after the tour. Pick up at 08:30 a.m. and take a 3-hour scenic drive to Daping Lou (大坪楼), located in Ganfang Village, Chuanchang Town. Then transfer to Fuxin Lou (馥馨楼) to visit one of the oldest tulous in Yongding. We will stay in a hotel in Hukeng. ll drive back to Xiamen after the tour. Pick up at 08:30 a.m. and take a 3-hour scenic drive to Chengqi Lou (承启楼), the largest grandness circular tulou composed by 4 circular buildings. 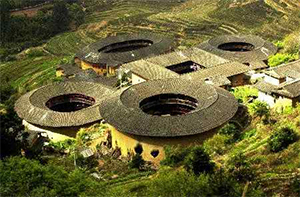 Then transfer to Chuxi Tulou Cluster (初溪土楼群) to visit its five large circular buildings and ten rectangular buildings. We will stay in the 4-star Capital of Hakka Hot Spring Resort. Visit Nanxi Tulou Cluster (南溪土楼群), the "Great Wall of Tulou" with more than 100 earth buildings in the valley stretching for 10km, and Hongkeng Tulou Cluster (洪坑土楼群), the most concentrated place of earthen house clusters. We will drive back to Xiamen after the tour. Depart From: Xiamen at 8.30 a.m. Pick up at 08:30 a.m. and take a 3-hour scenic drive to Yunshuiyao (云水谣), a beautiful ancient village in Nanjing County, Zhangzhou. The idyllic village has cobblestone pedestrian paths along a stream where visitors could leisurely stroll to the different tulous within the village. Visit Yunshuiyao Ancient Village. 30 minutes private coach transfer to Gaotou village, visit Chengqi Lou(承启楼), the largest grandness circular tulou composed by 4 circular buildings. After the tour, we will drive for 3 hours to return to Xiamen. Pick up at 08:30 a.m. and take a 3-hour scenic drive to Nanou village (南欧村), located in Shuyang Town, Nanjing County. The village has the highest density of tulous in the region which are of different shapes: round, square, trapezium and triangle. Visit Hekeng tulou cluster (河坑土楼群), a village with 13 tulous. It is one of the 10 sites collectively inscribed as the "Fujian Tulou" on the UNESCO World Heritage List. It is indeed a complete village, with a dozen or so full-size tulou, plus some smaller adobe buildings. Visit Shiqiao tulou cluster (石桥土楼群) where is home to the largest tulou Shunyu Lou (顺裕楼). The place looks like a perfectly normal living and working village, and most tulous are still lived in. We will drive back to Xiamen after the tour. Pick up at 08:30 a.m. and take a 3-hour scenic drive to Chengqi Lou (承启楼), located in Gaotou village, Shuyang Town. It is the largest grandness circular tulou composed by 4 circular buildings. Visit Chuxi tulou cluster (初溪土楼群) to see Jiqing Lou (集庆楼), the largest round tulou, and also the oldest in this cluster, built in 1419. Pick up at 08:30 a.m. and take a 3-hour scenic drive to Daping Lou (大坪楼), located in Ganfang Village, Chuanchang Town. Visit Chuxi tulou cluster (初溪土楼群) to see Jiqing Lou (集庆楼), the largest round tulou, and also the oldest in this cluster, built in 1419. Chuxi is perhaps the most picturesque of the tulou clusters. It consists of five large circular buildings and 10 rectangular buildings. They are surrounded by enchanting mountains and streams. Their layout is arranged in a scientific and rational way. Pick up at 8:30 a.m. Visit Shuhai Waterfall (树海瀑布) in Nanjing County in the morning. Then visit Chengqilou (承启楼), the largest circular building containing four circular buildings. Check in at the Capital of Hakka Hot Springs Resort. Check out from the hotel in the morning, drive three and a half hours to Pinghe (平和). Visit Zhuangshang Tulou (庄上土楼), the world’s largest tulou in terms of size and residential population. Later, visit Lingtong Mountain (灵通山) for its picturesque scenery and beautiful temples. After that, drive back to Xiamen. *Pick up at 08:30 a.m. and take a 3-hour scenic drive to the Tianluokeng Tulou Cluster (田螺坑土楼群) to visit the '4 dishes and 1 soup'. *Then pass Taxia village(塔下村)(one of the beautiful village build along a stream),roaming at this water village, visit Zhang's clan ancestral hall(张氏祠堂),which is listed among the key culture relics protected under national level. 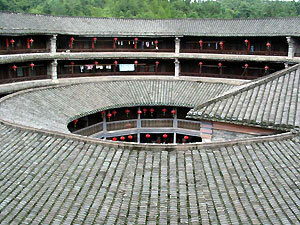 *Visit Chengqi Lou (承启楼) the largest grandness circular tulou composed by 4 circular building. *After that, visit the Yongding Hongkeng Tulou Cluster (永定土楼群), the most concentrated place of earthen house clusters, including Zhenchenglou(振成楼)(a magnificent building combining the Chinese style with the western style), Kuijulou(奎聚楼)(a palace style building), Fuyulou(福裕楼) ( a five-phenix style building ), Rushenglou(如升楼) ( a mini-sized circular building). *Then visit Nanxi Tulou Cluster (南溪土楼群), the "Great Wall of Tulou" with more than 100 earth buildings in the valley stretching for 10km. *Visit Chuxi tulou cluster (初溪土楼群) to see Jiqing Lou (集庆楼), the largest round tulou, and also the oldest in this cluster, built in 1419. Chuxi is perhaps the most picturesque of the tulou clusters. It consists of five large circular buildings and 10 rectangular buildings. They are surrounded by enchanting mountains and streams. Their layout is arranged in a scientific and rational way. *Visit Hekeng tulou cluster (河坑土楼群), a village with 13 tulous. It is one of the 10 sites collectively inscribed as the "Fujian Tulou" on the UNESCO World Heritage List. It is indeed a complete village, with a dozen or so full-size tulou, plus some smaller adobe buildings. 08:30-11:30: Get picked up at 8:30 a.m. and take a three-hour scenic drive to the Tianluokeng tulou cluster (田螺坑土楼群). 12:00-13:00: Arrive at Tianluokeng and have a traditional Hakka lunch at one of the Hakka houses. 13:00-14:00: Roam around the Tianluokeng Hakka cluster (田螺坑土楼群) to have a look at day-to-day life in the area. 14:00-15:30: Take a 15-minute coach transfer to Xiaban Village (下坂村), visit Yuchanglou (裕昌楼, a leaning-structure Hakka house), then pass Taxia village (塔下村, a beautiful village built along a stream). Stroll through this water village, visit the Zhang clan ancestral hall (张氏祠堂), which is listed as a national-level key culture protected relic. 15:30-16:30: Visit Daping Lou (大坪楼), a well-preserved authentic Tulou that houses more than 200 people; the people here still keep their original lifestyle. 16:30-19:00: Ride three hours back to Xiamen. 8:30-11:30: Get picked up at 08:30 a.m. and take a three-hour scenic drive to Hongkeng Tulou cluster (洪坑土楼). 11:30-12:30: Arrive at Hongkeng Tulou cluster (洪坑土楼) and have a traditional Hakka lunch at one of the Hakka houses. 12:30-14:00: Visit Yongding Hakka cultural village (永定土楼群), including Zhenchenglou (振成楼, a magnificent building combining Chinese and western architecture), Kuijulou (奎聚楼, a palace style building), Fuyulou (福裕楼, a five-phoenix style building), and Rushenglou (如升楼, a mini-sized circular building). 14:00-15:30: Visit Daping Lou (大坪楼), a well-preserved authentic Tulou that houses more than 200 people; the people here still keep their original lifestyle. 15:30-18:00: Ride 2.5 hours back to Xiamen. 08:30-11:30: Get picked up at 08:30 a.m. and take a three-hour scenic drive to Hongkeng Tulou cluster (洪坑土楼). 12:30-14:30: Visit Yongding Hakka cultural village (永定土楼群), including Zhenchenglou (振成楼, a magnificent building combining Chinese and western architecture), Kuijulou (奎聚楼, a palace style building), Fuyulou (福裕楼, a five-phoenix style building), and Rushenglou (如升楼, a mini-sized circular building). 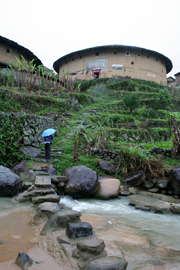 14:30-15:30: Visit Hekeng tulou cluster (河坑土楼群), a village with 13 tulou. It is one of the 10 sites collectively inscribed as the "Fujian Tulou" on the UNESCO World Heritage List. It is indeed a complete village, with a dozen or so full-size tulou, plus some smaller adobe buildings. 15:30-18:30: Ride three hours back to Xiamen. 08:30-11:00: Get picked up at 08:30 a.m. and take a 2.5-hour scenic drive to the idyllic Yunshuiyao Village (云水谣). 11:00-15:00: Stroll through Yunshuiyao Ancient Town (云水谣) and enjoy the village's ancient beauty. Have a traditional Hakka lunch at noon. 15:00-16:00: Visit Daping Lou (大坪楼), a well-preserved authentic Tulou where Hakka people still keep their original lifestyle. 16:00-18:30: Ride 2.5 hours back to Xiamen. 08:30-11:00: Get picked up at 08:30 a.m. and take a 2.5-hour scenic ride to the idyllic Yunshuiyao Village (云水谣). 11:00-14:30: Stroll through Yunshuiyao Ancient Town (云水谣) to take in the ancient beauty of the village. Have a traditional Hakka lunch at noon. 14:30-15:30: Visit Chengqi Lou (承启楼), nicknamed "the king of the tulou," at the Gaobei Tulou cluster at Gaotou village of Yongding County. About 5 kilometers from Hongkeng Tulou, Chengqi Lou is the largest grand circular tulou; it is comprised of four circular buildings. This massive round tulou has 400 rooms altogether and once housed 80 families with a total of over 600 people in its most prosperous days. 11:30-14:30: Stroll through Yunshuiyao Ancient Town (云水谣) to take in the village's ancient beauty. Have a traditional Hakka lunch at noon. Hire a car and discovery your ways !! We also offer car rental services from xiamen to Yongding or Nanjing hakka villages. Just hire a car and an excellent driver then discovery your ways.